Creamy pumpkin soup with hints of cinnamon and ginger is my favorite comfort food on a chilly night. Though fall officially began a little over 3 weeks ago, we’ve only recently had “real” fall weather: cooler temps, lower humidity. Jeans-and-hoodie weather. Hearty, delicious soup weather. I only recently have come to love soup. Growing up, I was a chicken-noodle-soup-and-nothing-else girl. I’ve branched out more. Bisques, chowders, creamy soups . . . I’ll almost anything once. While planning to host my first Thanksgiving in 2008, I decided I wanted to serve soup as a first course. About two months before, I had tasted squash-and-pumpkin soup for the first time, and really enjoyed it. 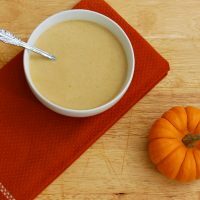 I found a highly-rated recipe for cream of pumpkin soup on AllRecipes.com. I served it as my first course, and everyone loved it! I blogged about it almost two years ago, and it’s always been the first soup recipe I make each autumn. Each time I cook it, I make a few modifications to make it even better, so I’ve decided to share it with you again. As written below, the recipe makes 6 main-course servings, or 8 first-course servings. I always double the recipe, and freeze some to eat later. If doubling, you’ll need a large stockpot to accommodate cooking the soup. I usually serve it with a loaf of warm, crusty French bread. In a large saucepan or stock pot, melt the butter over medium-high heat, and saute the chopped onion for 2 to 3 minutes, until tender. Add one of the cans of chicken broth, stir well, and bring to a boil. Once it reaches a boil, cover the saucepan, reduce the heat to low, and simmer for 15 minutes. Remove saucepan from heat, and puree the onions and broth until smooth with an immersion blender. Alternately, cool the broth to room temperature before transferring, in batches, if necessary to a blender and pureeing until smooth. Return the mixture to the saucepan. Add the remaining can of broth, and the pumpkin, salt, cinnamon, ginger, nutmeg, allspice, black pepper, cayenne, and brown sugar. Stir until all ingredients are blended and the sugar melts. Bring the mixture to a boil. Cover, and reduce the heat to low, and simmer for 10 minutes, stirring occasionally. Remove the saucepan from the heat and stir in the heavy cream until fully incorporated. Ladle into individual soup bowls. Serve with crusty French bread, if desired. What a great soup! If I may, I’d like to invite you to submit your photos to the new YumGoggle, a photo sharing site with the philosophy that if you worked hard to cook it and photograph it, we should show it off! Hope to see you there soon! Hi! Just wondering where the 2% milk comes in? So sorry! It’s added along with the cream in the last step. 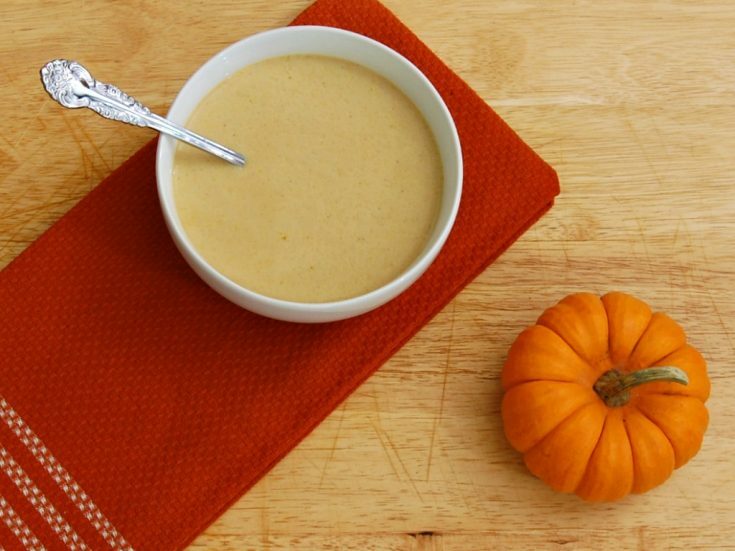 I have never had a pumpkin soup but all of the flavors in it sound delicious! Thanks for linking up the recipe to the #Celebrate365 Soup Swap!